We’re thrilled to announce the release of the FusionCharts Beginner’s Guide: The Official Guide for FusionCharts Suite. To celebrate this milestone, we’ve teamed up with Packt Publishing to give you a chance to win a copy of the FusionCharts Beginner’s Guide. This book is both for beginners and advanced web developers who need to create interactive charts for their web applications. No previous knowledge of FusionCharts Suite is assumed. It’s the best way to get you up and running with FusionCharts, and takes you right from downloading it to creating complete reports and dashboards. Even if you’re already using FusionCharts, you’ll find oodles of tips & tricks, hacks, and best practices to make your charting life a lot easier, and awe your users with the delightful charts. Convinced this book is the best thing since sliced bread? Read on to find out how you can win a copy. 2) Drop a line via the comments below to let us know what interests you the most about this book. It’s that simple! 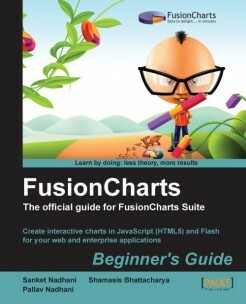 Prizes: 3 Lucky winners get a free copy of the FusionCharts Beginner’s Guide. Print copies can only be shipped to winners in the US and UK, and if you’re from any other country, you’d receive the ebook version. Deadline: The contest will close on 15 June, 2012. Winners will be contacted by email, so be sure to use your real email address when you comment! I’ve used that awesome product… And i’m interested to know if i have used the best practices/way … !! Its high time we move away from the traditional charts being used for decades now. FusionCharts looks like an interesting tool to get your audience’s attention to your presentations. The last chapter seems very interesting that guide to make better look and feel, it is a good supplementary to make perfect visualization to user. It is very important to use principles of UI design to achieve best result that mentioned in this book specially for this software. the chapters on fully customizing tge graphs as well as choosing the right graph for the type of data to display. For integrating charts in java,php or ruby on rails applications I have always used the official online documentation from the FusionCharts website. The documentation itself is quite elaborate, can’t complain. For customizing a chart to the desired look and feel, I always looked up on the site/forums. With this book on my desk, I think these tasks can be completed faster. Can’t wait to get my hands on it. I think it is the perfect way to teach the users that how to use a charting product in your application.Its really helpful for beginners and who already used this product. The drill-down functionality. It gives a large number of possibilities for user to interact with the product and discover some insightful information. I was really excited to see such functionality on Linkedin. I believe the book can help me to implement this and many other interactive/ informative features in an efficient and structured manner. Please send me a copy! We’ll get in touch with you soon to send you your copy of the FusionCharts Beginner’s Guide. Happy reading! I went through the first chapter and I liked what happened comments – It is also taking the reader step by step with visual example . . .